It is incredible to me to think that the attacks on 9/11 happened ten years ago today. I recently found several newspapers in my closest from that fateful day. The newspapers outlined what had happened and included various pictures from the day. 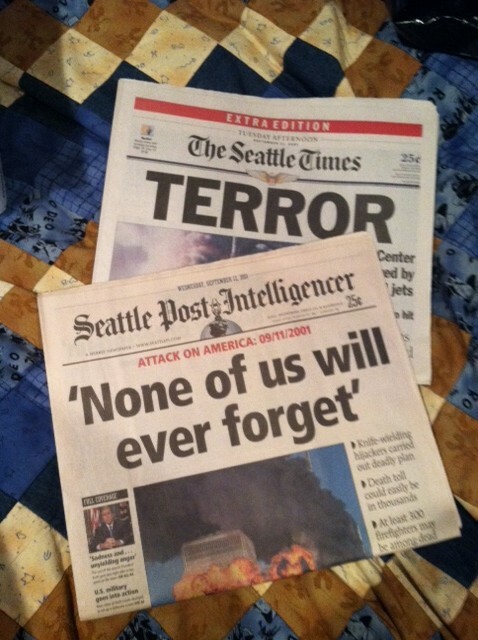 These newspapers had been placed in my closet on 9/12 and I had completely forgotten them. Finding them, around the same time as the ten year anniversary of the attacks, really took me back to that day. I remember where I was, what I was doing and exactly what I saw and hear unfold over the course of the day and the following days, weeks and even years. However, it is not just the feelings and emotions that have stayed with me over the years, there is much more than that. That day taught me that there is true courage alive in this world, along with men and women who are willing to lay their lives aside in an effort to save others. I admire the men and women of 9/11 so incredibly much. They were fathers, mothers, husbands, wives, sons and daughters who knew the importance of fighting to save others. Many of these rescue workers survived, but many did not. The rescue and emergency workers in New York and DC, the brave passengers in Pennsylvania, and the countless others who helped in some way…what they did will stay with me and serve as an inspiration to me for years to come. I look forward to the day I tell my kids the stories of these men and women and the true bravery they showed.